This is such a cool way to communicate. Thanks for setting it up, Ben. Another day of nice weather at Sepphoris. 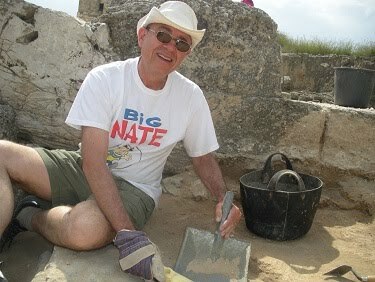 The archaeology was a bunch of measuring and moving stones, digging, and sifting. The most exciting event was discovery of a pretty ugly Ottoman period coin, once used in jewelry, which was found in an area of quite late fill. We did a lot of preparation work for opening some new probes tomorrow and we will see what that will bring. Today also the Israeli TV station Channel 1 came and did a big feature story on Eric and Carol Meyers and their work here at Sepphoris. One never knows if some of us worker bees might show up in background shots. This afternoon we took a field trip to the excavations at Beit Shean, probably the largest excavated city of ancient Israel. Our lead graduate student of the excavation, Ben Gordon, gave us a wonderful tour of the site. What a difference it makes to visit a site with graduate students who are so very knowledgeable about every aspect of the excavations and also are able to read the various Greek inscriptions, etc. and etc. Copyright 2011 David Hendin. Awesome Inc. theme. Powered by Blogger.